Maryland and Virginia lawmakers are offering proposals to expand access to drug treatment programs, but there has been an institutional reluctance to fund the kind of treatment that one former drug czar says is most effective. In the final story in her series "Hooked on Heroin," WTOP's Jamie Forzato looks ahead to this year's legislative session and discusses what lawmakers are preparing to do. This final story in WTOP’s series, Hooked on Heroin: Deadlier than ever, looks ahead to this year’s legislative session and discusses what lawmakers are prepared to do to turn the tide of this heroin crisis. HANOVER, Md. – The state of Maryland is failing at providing effective opioid abuse treatment, said Mike Gimbel, former Baltimore County drug czar. Top politicians, including President Barack Obama, agree. Maryland and Virginia lawmakers are offering proposals to expand access to treatment programs in their states. Virginia Gov. 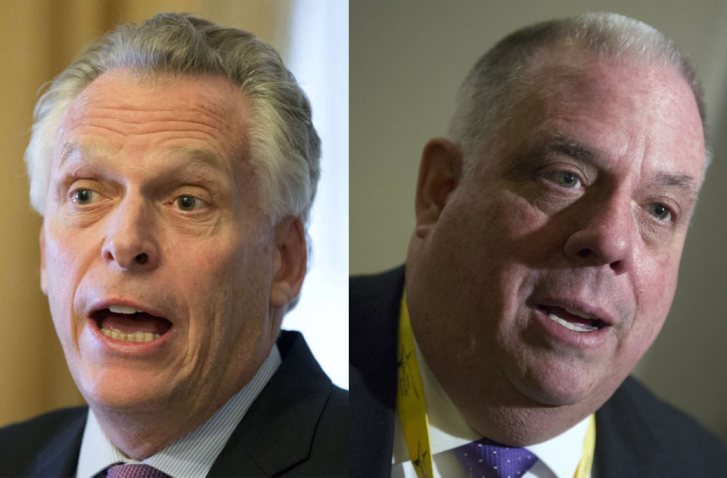 Terry McAuliffe announced he is seeking more than $31 million to strengthen the state’s mental health system, including $5.3 million to provide medication-assisted treatment and to buy thousands of doses of naloxone, an overdose-reversal medication. The legislative reforms he introduced will limit opioid prescriptions written in emergency departments to three days. He also supports allowing state-certified REVIVE! trainers to distribute naloxone during free training classes, and the expansion of drug court eligibility to include people convicted of violent crimes. Maryland Lt. Gov. Boyd Rutherford told WTOP he expects treatment access to be a priority during the General Assembly session. “There needs to be an emphasis on care, particularly quality of care,” he said, but he didn’t offer specifics. Gov. Larry Hogan has not released a budget yet. The Washington Post has reported that other bills expected to be introduced include a measure to keep treatment centers open and mandating treatment for anyone who is revived with naloxone. But there has been an institutional reluctance for states to dedicate taxpayer money to affordable drug treatment centers. Following the recommendation from the state’s Heroin and Opioid Emergency Task Force, Hogan announced in August that $3 million in state grants would be used to fight the epidemic. The money was allocated to help police track down violent offenders and heroin coordinators to collect data about overdoses. But none of the money went to in-patient treatment centers. Though the D.C. Council enacted a law, currently under congressional review, expanding access to naloxone, no current bills address treatment. As state lawmakers grapple with how to address the epidemic, police departments are filling in the gaps with a new treatment-centered attitude. Where lawmakers fail to agree, officers are pulling together to provide in-person resources on the ground every day. Over the last couple of years, law enforcement agencies have changed their perception about how to best tackle the opioid epidemic. Officials now say they can’t “arrest their way” out of this crisis and are taking a more holistic approach. Every suspected heroin addict arrested in Anne Arundel County, Maryland, receives a letter from Police Chief Tim Altomare, pleading with them to let the department help them on the road to recovery. “Drug treatment can work. People recover from addiction every day. WE BELIEVE YOU CAN DO IT BUT WE CAN’T DO IT FOR YOU,” the letter reads. But letters and outreach can only go so far. And Altomare said the state needs massive increases in treatment funding. “There aren’t enough treatment beds in the state. That goes hand-in-hand with the treatment beds for mental disorders. About 85 percent of people fighting addiction have a co-occurring emotional health disorder like bipolar disorder or paranoid schizophrenia,” Altomare said. Montgomery County State’s Attorney John McCarthy puts some of the responsibility for inadequate treatment squarely on the shoulders of insurance companies. He would like the legislature to rewrite insurance regulations to mandate more coverage. “You need about 18 months of profound treatment to get away from the psychological control of the drug and really beat the addiction. The reality is that we put young people into treatment and it’s just not sufficient,” he said. In early 2015, Cox and two Fairfax County detectives tried to tackle this crisis in a unique way. They formed a partnership with the Community Services Board to create an informational packet full of addiction recovery resources. The goal was to dispatch a detective to the scene of every heroin overdose and distribute those packets. But it didn’t work as planned. Out of about 100 overdose cases, Cox said he only knows of one person who sought help. With only two detectives on this task force — and because most overdoses occur between midnight and 4 a.m. — Cox had to make the difficult decision to cut back. “If an addict doesn’t want help, they’re not going to get help,” he said. Instead, Cox’s latest initiative is working to create a Recovery Call List – a resource for people apprehensive about interacting with the police. On-call civilian volunteers who are currently in recovery would immediately respond to the scene of an overdose. “So at 2 o’clock in the morning, when someone is admitted to Fairfax Hospital for a heroin overdose, a person on this list can reach out and say: ‘Hey. I’ve been there. I’ve done that. This is where you can be right now,’” he said. Cox’s team recently arrested a pregnant woman on heroin charges. But instead of taking her to jail that night, they coordinated with the Community Services Board to get her into rehab as she waits for trial. “She needs to beat the drug first, and then we’ll deal with her in the criminal justice system later. First thing we need to do is keep her alive and get her help,” Cox said. Lawmakers will spend several months hashing out how they want to shape their states’ policies on addiction prevention and treatment. But critics say they’re not focusing on the right ideas. “They don’t understand what drives the addict,” Mike Gimbel said. Gimbel called these “intellectual pipe dreams” that aren’t based in reality. Gimbel went from shooting heroin every day in high school to becoming the director of Baltimore County’s Bureau of Substance Abuse. When he hit rock bottom, he enrolled in a long-term drug-free treatment facility in California. A few months ago, he celebrated his 44th year of sobriety. As states consider expanding treatment-focused programs for drug users, police are also pushing lawmakers to consider increasing prison sentences for drug dealers. In October 2015, Anne Arundel County detectives captured the biggest heroin distribution ring in county history after an eight-month, multi-agency investigation. Nearly $1 million in assets were seized, including three kilograms of heroin, 1.5 kilograms of cocaine and 12 firearms. The drug kingpin was sentenced to 25 years in prison, and the bust made a big dent in the area’s drug trafficking, but officials knew that void would be filled by new dealers who wanted to infiltrate the market. In Montgomery County, after one particularly deadly week, State’s Attorney John McCarthy and Maryland Del. Kathleen Dumais drafted legislation in 2015 aimed at cracking down on dealers who sold drugs that caused a fatal overdose. The bill would have allowed judges to sentence such dealers to prison for up to 30 years, and it had widespread support among the law enforcement community. But it wasn’t brought to a vote on the House floor. “There was a sense that it would unduly affect African-Americans or other minorities in Baltimore City,” Dumais said. A similar bill in Virginia, which would have increased the maximum penalty to 40 years, also failed that year. Law enforcement officials urge politicians to reconsider bringing these measures up for a vote this year. “If it leads to death, we should be able to charge them with homicide,” Cox said. While lawmakers slog through committee hearings, arguing about language and scrounging for money, the body count rises. Altomare recalled one weekend last year when three people fatally overdosed in a 24-hour period. Read all five parts of this series. Hooked on Heroin: Park 9 — What are lawmakers prepared to do?